Vancouver, BC - Skyharbour Resources Ltd. (TSX-V: SYH) (OTC Grey: SYHBF) (“Skyharbour”) is pleased to announce the completion of gravity surveys which have identified 23 gravity low anomalies on the Western Athabasca Syndicate’s (the “Syndicate”) flagship Preston Lake Uranium Property (the “Property”). The program also included a RadonEx survey (ground and water) to further define targets in advance of a drill program slated to commence in March. 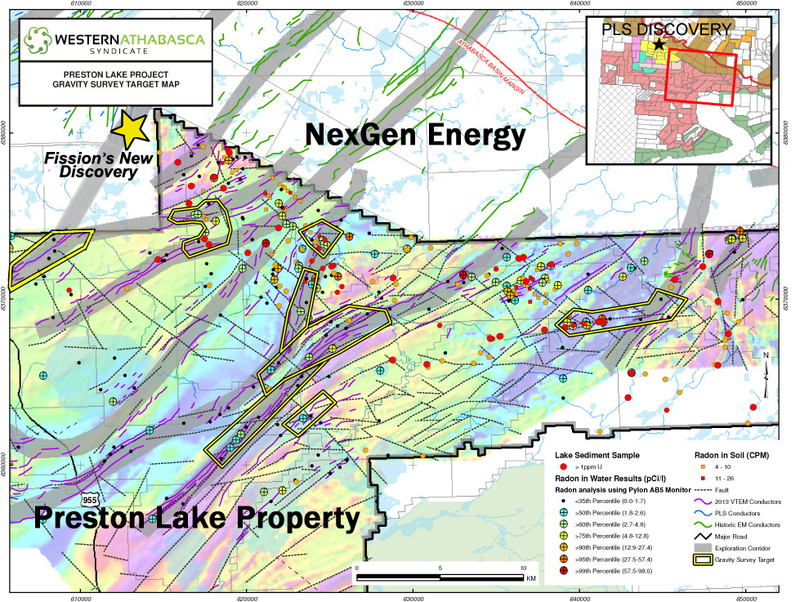 The 246,643 hectare Preston Property is the largest individual property proximal to Fission Uranium Corp.’s Patterson Lake South (“PLS”) high-grade uranium discovery and the recent discovery made by NexGen Energy (TSX-V: NXE) on the Rook 1 Project (see NexGen’s news release dated Feb. 19th, 2014). The Syndicate is the largest land tenure holder in the southwest Athabasca Basin region including properties strategically situated to the southwest and to the northeast of the PLS and NexGen discoveries. Interpretation of the gravity data by Phil Robertshaw, P.Geo., has successfully delineated gravity low anomalies associated with previously identified high-potential exploration corridors defined by structure, magnetic lows, conductors, favorable geology and geochemistry. Gravity is a defining tool for exploration for uranium in the Athabasca Basin and was a key mechanism for vectoring in on the recent discovery made by NexGen at the Rook 1 Project. Hydrothermal fluids associated with high grade uranium deposits will cause extensive alteration of the host rock, resulting in displacement and removal of minerals/elements, creating porosity and subsequent density contrast. This density contrast will be expressed as a gravity low anomaly and is a prime drill target when qualified by other coincident indicators of uranium mineralization such as geochemistry and radon. In addition, several of the Syndicate's gravity low targets have been further refined using a proprietary RadonEx survey which has been instrumental in assisting with numerous discoveries in the Athabasca Basin region. The Syndicate is carrying out a ground EM survey to further refine conductor trends and pinpoint drill pad locations. Details concerning the upcoming drill program shall be provided in the near-future. 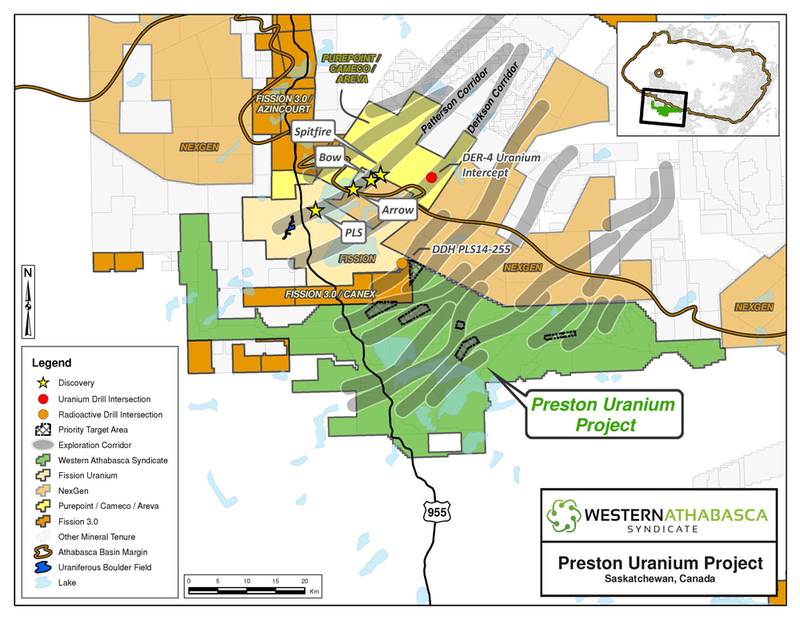 The 246,643 hectare Preston Lake Property is the largest land package proximal to the Patterson Lake South (PLS) high-grade uranium discovery, owned by Fission Uranium Corp. The Syndicate continues to employ a systematic, proven exploration methodology that has led to numerous uranium discoveries in the region and throughout the Athabasca Basin. This has been very effective in identifying numerous high-quality targets with similar geological features and exploratory indicators also present at the nearby PLS discovery and in other deposits in the Athabasca Basin. Management cautions, mineralization present on proximal properties is not necessarily indicative of mineralization on the Syndicate’s Property.